As cloud technology has matured, what was once an IT paradigm shift has triggered a business paradigm shift. The flexibility, immediacy, scalability and affordability of virtualization technologies have become not just an IT advantage, but a real competitive advantage for businesses. What are needed now are cloud solutions that are built to be business-friendly. While the cloud can’t do everything – at least not yet – there are plenty of things that HostForLife.eu Cloud Hosting Solutions can do. And they do them very well for all kinds of business needs. Cloud Servers and Shared Cloud Hosting are more than just rehashes of antiquated virtualization techniques and models. These are the cloud solutions that businesses and their IT administrators have been waiting for. HostForLIFE was established to cater to an underserved market in the hosting industry; web hosting for customers who want excellent service. This is why HostForLIFE continues to prosper throughout the web hosting industry’s maturation process. DotNetNuke 7 is coming with new features and more productive. It is also claimed more advanced development framework to date. It comes with support of active directory and ShrePoint Lists. With the updated look and fill, DNN 7 installation completes in few steps with simplified install process. Even it is quick, it allows you to configure advanced features. DotNetNuke 7 comes with new control panel. Each menu have been updated to offer more inituitive experience. End Users can personalize the menu by creating their own bookmarks within menu. The Modules, Pages and Users menu items provide quick access to common features in those areas. DotNetNuke 7 allows you sharing same module on multiple portals/sites within same DotNetNuke instace. It will make easy to share same HTML content accross site. You can now drag modules between panes and from the control panel to a pane while in edit mode. Drag and Drop allows page designers to quickly and easily add content and arrange it on a page however they like. SharePoint List support and Active Directory are added to Enterprise DNN 7. User can login their Active Directory Credentials. DotNetNuke 7.0 extends your SharePoint investment by adding support for popular SharePoint Lists in our Microsoft SharePoint Connector. You can get all the new features above as low as €2.45/month at HostForLIFE.eu. In an enterprise environment a web application with all of its dependencies needs to move across various environments before being finally being deployed to a production server. A typical set of transition servers are development, testing/QA, staging/pre-production and production. Also on the production environment there are web farms where these webs need to be replicated. Today doing all these things is more or less a manual process and involves a tons of documentation that both developers and server admins have to deal with. Even with all the documentation the steps are certainly very much prone to errors. To aid all these scenarios we are introducing the concept of a "Web Package". Web Package is an atomic, transparent, self describing unit representing your web which can be easily hydrated onto any IIS Web server to reproduce your web. 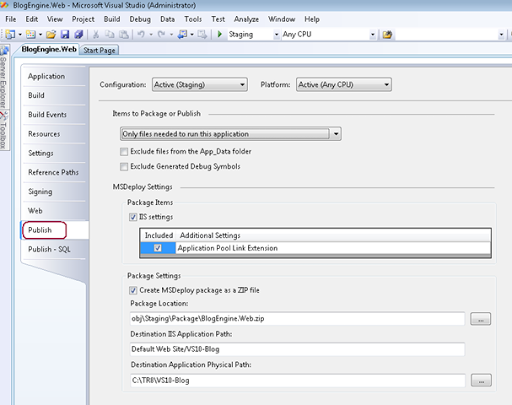 VS 2010 uses MSDeploy to create the web package from your web application. 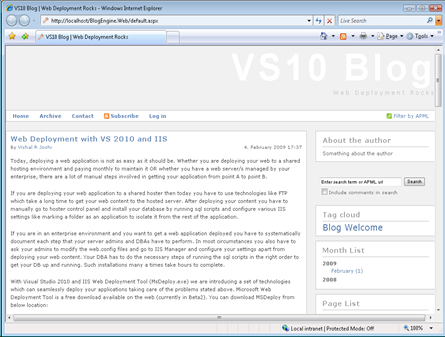 In today's post I will be primarily focusing on creating a web package from VS 2010 which has IIS Settings as well as web content. For this discussion we have BlogEngine.Web downloaded from codeplex and converted it into a WAP. Then this project was opened in VS 2010 and the VS10 migration wizard moved the project into VS10 format. Thanks to the multi-targeting features in VS 2010 which can support .NET versions 2.0 till 4.0; hence it is up to you which Framework version you want to run your web against. Most IIS 7 web applications use IIS integrated pipeline which is configured with "Default App Pool" of IIS. Blog Engine .web does not use integrated mode and will throw an error shown below if made to run under "Default App Pool". Essentially, at the end of this step you should have your web application up and running with all the IIS settings configured in IIS Manager. The Publish tab is made configuration aware as deployment settings tend to change from environment to environment; for e.g. many a times developers want to deploy their “Debug” configuration on a Test Server and include PDBs as part of this deployment. When the same web is deployed in “Release” configuration on a production server the deployment may exclude PDBs. Items to Package/Publish – This section will help you decide what type of content you would really like to package/deploy. - Exclude Files from App_Data folder – “App_Data” folder is a special ASP.NET folder where many developers like to put their SQL Express DBs (.mdf/.ldf files), XML files and other content which they consider Data. In many situations on production web server a full version of SQL Server is available and using SQL Express is not all that relevant. In such scenario (and for the corresponding build configuration e.g “Release” ) a user can check the “Exclude Files from App_Data”. - Exclude Generated Debug Symbols – It is important to understand that generation of debug symbols is different from deployment of the same. 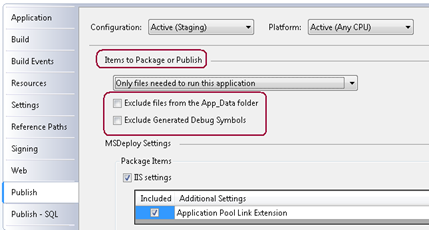 This check box will tell VS 10 whether you would like to package/deploy the already generated Debug Symbols. - Additional Settings - The items in this grid are advanced properties. It is still good to know about these coz it impacts what will be included in your package. Most of the properties in this grid are related to the entire server and not just to your application so you should use them very carefully. - Create MSDeploy Package as a ZIP file - This checkbox allows you to decide whether you would like to create your web package as a .zip file or as a folder structure. If you are concerned about the size and are moving the web package around very often then I can see you using .zip format for the package; on the other hand if you care to compare two packages using diff commands (either of source control or independently) then I can see you using the folder format. - Package Location - This is an important and required property as it defines the path at which Visual Studio will place your web package. If you choose to change this path make sure that you have write access to the location. Do note that the Package Location is modified based on whether you choose to create the web package as a .ZIP file or vs a folder structure. - Destination IIS Application Path/Name - This property allows you to give IIS Application name that you will use at the destination Web Server. - Destination Application Physical Path - One of the most important information which is embedded inside the web package is the physical location where the package should be installed. This property allows you to pre-specify this embedded information. You will have an opportunity change both IIS Application Physical Path as well as Application Name at the time of deployment but in this property page you are given an opportunity to choose a default value. Step 4: Create the "Web Package"
Right Click on your "Project"
When you see “Publish Succeeded” as below in the output window then your package is successfully created. To access the package go to the location specified in the “Package Location” textbox. By default this is in obj/Configuration/Package folder under your project root directory (Configuration here implies Active Configuration like Debug/Release etc). 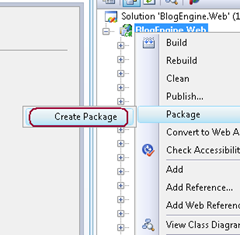 Note: "Create Package" command creates web package only for Active configuration. 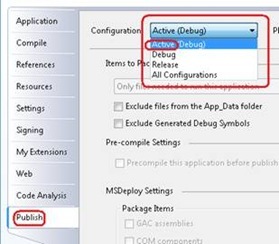 By default “Debug” is the active configuration inside Visual Studio. If you would like to change the Active configuration you can do so by using Build --> Configuration Manager.